Fuji have a large stand at the show – smaller than Canon/Nikon, but still a sizable (and no doubt expensive) piece of real-estate. 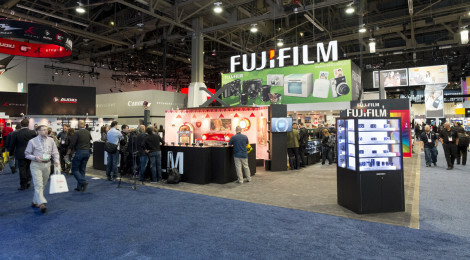 The booth is well staffed – plenty of Fuji representatives to talk to and demo equipment. The X-Series takes pride of place on the stand – with a prominent display case at the front corner. All current bodies and lenses were on display – no new unannounced hardware was on view. There was at least one of everything for people to pick up and play with, including the new X100S in black, the 56mm Lens, and the 10-24mm Lens. The main demo stage was a 50s diner set – which I’ll come back and shoot with the resident model later! Compared to my Canon 85mm f/1.2, it’s small and light! The lens was fixed to the demo camera and could not be removed – nor could I take away sample shots with it, as it is pre-production. The build quality matches the recent 14mm and 23mm lenses – very solid, nice click feel to the aperture ring, not loose at all. The balance with the camera was good, although I couldn’t try it on my X-Pro1. Lovely big piece of glass as you’d expect from an f/1.2 lens – 62mm Thread – no Lens hood on the demo model, and no one had a picture of what it would be like, so we’ll have to wait and see. Build quality reminded me of my 55-200mm zoom – feels smooth in the zoom, and the aperture ring is unmarked as with the other zooms. Again, a very good look and feel to this lens – I think Fuji have the design and quality piece dialed in now on the lenses. A large 72mm filter on this lens – again, no lens hood was provided so I can’t comment on that piece! All of the time I was there the stand had a buzz around it – with a lot of people coming and going – a real contrast to last year. There was a gallery at the rear of the stand showing work by the X-Series Photographers – very impressive prints. The stand has a lot more non X -Series to explore, and I’ll cover that later. I realize as I type that I completely forgot to check out the new grips! So I’ll go back and see what I can find on them. Your reportage about Ces 2014 is great.